If printed newspapers are slowly dying, are eBook readers the phoenix to rise from their ashes? Is the answer to next-generation media delivery really portable devices tailor-made for reading periodicals and daily news? With competition between smartphones, netbooks, laptops - not to mention the fact that delivery technology doesn’t directly address the cost issues associated with news generation, and reporting – the answer is debatable but plenty are taking a close look at the prospect, or even wagering a bet. News Corp., for one, has expressed interest in the exploration. Hearst is expected to launch its own product this year (and is also invested in display maker E ink). And then, the companies behind USA Today (Gannett) and the Financial Times (Pearson Plc) have also jumped, working with Plastic Logic. Whenever the products come out, though, they may be playing catch up. Amazon beat them all to the punch with its Kindle, and now, it appears, some new variation on the theme more narrowly aimed at news media may be revealed this week. Amazon sent out press invitations Monday for an event to be held Wednesday morning at 10:30am EST at Pace University in New York. 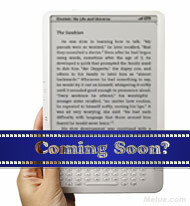 All expectations are that a larger screened Kindle sibling will be unveiled at the event. Based on the location some believe there may be an academic twist, and many think the New York Times may also be involved. The basis for that: Pace University, where the event is being held, began when two brothers founded Pace & Pace to teach accounting and business in 1906. The school’s first classes were taught in office space rented from the New York Tribune. Then forty five years later, the school bought its first campus building – the 19th century headquarters of the New York Times (via Wikipedia). The location screams newspaper history. Arthur Sulzberger jr., chairman of the New York Times Company, is expected to participate in the event along with Amazon chief, Jeff Bezos. So back to that bigger question – are eReaders core in newspapers’ future? That’s hard to say. For Amazon, Kindle serves as a platform for selling more content (regardless of source) and the motivation and opportunity there is easy to grasp. But for news outlets, where an e-reader’s function is more direct, and the prospect more risky, that’s different. For one, when it comes to print media the costs of investigative reporting and news generation can be extremely expensive (see here for some stats). Digital distribution reduces some of those costs but it doesn’t necessarily change the economics entirely. There’s also heavy competition in digital display products to contend with – everything from smartphones to portable computers are capable of serving the same purposes as a proprietary reader and more. A product specially suited and readymade to function as a news reading might succeed on a mass scale if its executed well, or it could turn out to be ideal only for some markets (text book replacement for students- as one of the rumors go), but if it comes up even a little short, there could be trouble too. …for many of us [in the newspaper industry], our long-term financial success will be determined by how quickly our digital revenue growth outpaces the downturn in our print revenues. At The New York Times Company, we are focusing on three key levers to achieve this breakthrough moment: attracting more users, deepening their engagement and then earning revenue from their usage. To do all this will require making bets on how this new medium will evolve and making investments in that vision. Working with digital readers, seems to be one of the bets. It may attract more users. It may not. But beyond audience, it serves other ends too: the DRM technologies in e-readers, for example, could help stem the theft/duplication of content (which is an issue many ad-supported website delivered news services face). The subscription-based digital revenue eReaders could offer, also brings a new higher margin channel, whether there are ad supported elements or not. Then there’s control: having a stake in the distribution directly (as opposed to simply licensing content to other eReader stores in the future) would also help mitigate the risk that content owners and their products become a commodity. Newspapers don’t want to end up creating a powerful middleman to their own detriment. (Something record labels arguably faced as iTunes grew in scale as a digital music distributor). So for the papers, the “why” makes sense. The question is will customers find similar value with news-centric e-reader devices. It’ll be a while before the answer becomes clear. It’s a gamble. But we’ll see what Amazon is imagining soon enough. Update 5/5: A day to go until Amazon displays whatever is hiding up its sleeve; rumors are flying about what to expect. The speculation covers both feature sets and purpose. Leading the crop, and appearing highly credible, are new reports at least one of the announcement’s components will center on education/academic applications for the device. The WSJ is reporting that Pace University, Case Western, Princeton, Reed, the Darden School at the University of Virginia, and Arizona State will all test pilot programs where students use Kindles instead of text books beginning in the fall semester.